, corresponding to amino acids 1-30 of Human Heme Oxygenase 1. Recombinant Human or Rat HO-1 (Hsp32) Protein. HEK293 treated with 30 uM hemin for 18hrs (see Abreview). IHC-P: FFPE human spleen normal. Our Abpromise guarantee covers the use of ab13248 in the following tested applications. WB Use a concentration of 4 µg/ml. Detects a band of approximately 32 kDa (predicted molecular weight: 34.6 kDa). ELISA Use a concentration of 2 µg/ml. Sandwich ELISA Use a concentration of 5 µg/ml. Can be paired for Sandwich ELISA with Rabbit polyclonal to Heme Oxygenase 1 (ab13243). 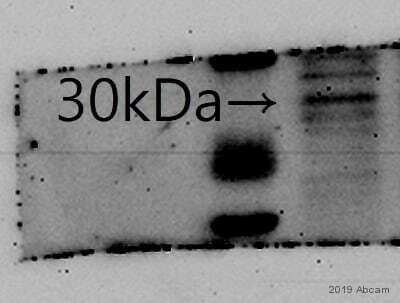 For sandwich ELISA, use this antibody as Capture at 5 µg/ml with Rabbit polyclonal to Heme Oxygenase 1 (ab13243) as Detection. IHC image of Hem Oxygensae 1 staining in a section of formalin fixed, paraffin embedded normal human spleen tissue section*, performed on a Leica Bond™ system using the standard protocol F. The section was pre-treated using heat mediated antigen retrieval with sodium citrate buffer (pH6, epitope retrieval solution 1) for 20 mins. The section was then incubated with ab13248, 5µg/ml, for 15 mins at room temperature and detected using an HRP conjugated compact polymer system. DAB was used as the chromogen. The section was then counterstained with haematoxylin and mounted with DPX. The following proteins and lysates were electrophoresed; Lane 1 - Heme-Oxygenase-1 (Hsp32) Protein (50ng), lane 2 - Heme-Oxygenase-2 protein NSP-550 (100ng), lane 3 - MDBK Cell Lysate (20ug), lane 4 - Mouse liver microsome (20ug) and lane 5 - Dog liver microsome (20ug). ab13248 was applied at a concentration of 4ugml-1. Immunohistochemistry (Frozen sections) - Anti-Heme Oxygenase 1 antibody [HO-1-1] (ab13248)Image courtesy of Mtuhtu S.Gounder by Abreview. ab13248 staining Heme Oxygenase 1 in murine heart tissue by Immunohistochemistry (Frozen sections). Tissue was fixed in paraformaldehyde, permeabilized, blocked using 2% serum for 1 hour at 30°C and then incubated with ab13248 at a 1/300 dilution for 12 hours at 4°C. The secondary used was an Alexa-Fluor 488 conjugated goat polyclonal used at a 1/500 dilution. The green colour indicate Heme Oxygenase 1. 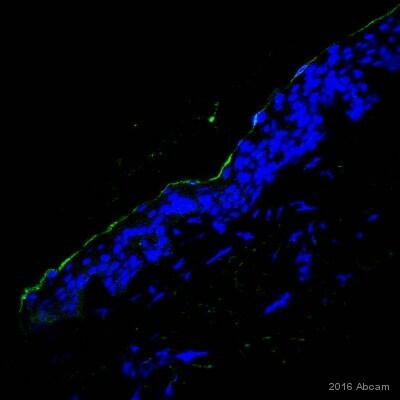 The blue colour indicate nucleus stain DAPI. ab13248 at 10µg/ml staining Heme Oxygenase 1 in human lung cancer A2 cells by flow cytometery. The left image repersents staining with isotype control antibody and the right image show staining with ab13248. Publishing research using ab13248? Please let us know so that we can cite the reference in this datasheet. - Please add cocktail of protease inhibitors in lysates. - This antibody works perfect in reducing conditions. Please add DTT in sample buffer. - Try heating the lysates at 100C for 10 minutes. - Load 20-30ug of lysates. 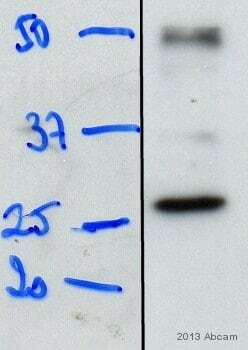 - Try 5-10 ug/ml of antibody concentration. - Please make sure the secondary is a anti-mouse antibody. As we discussed on the phone, I am attaching our questionnaire so that we can gather further information regarding the samples tested and the protocol used. Once we receive the completed questionnaire, we will look at the protocol and see if there are any suggestions we can make that may improve the results. This information will also allow us to investigate this case internally and initiate additional testing where necessary. If the product was purchased in the last six months and is being used according to our Abpromise, we would be happy to replace or refund the antibody. We are planning to purchase a BCA kit for protein quantification. Do you have any item apart from ab102536 https://www.abcam.com/BCA-Protein-Quantification-Kit-ab102536.html from Abcam? We have another kit, the Protein Quantitation Kit (Bradford Assay), ab102535, which may also be of interest to you. Or we also have Bradford reagent available from our catalogue, ab119216 and ab119216 for 500 and 1000 mL respectively. This can be used to set up your own protein quantification assay. If you have any further questions relating to these products please do not hesitate to let me know. 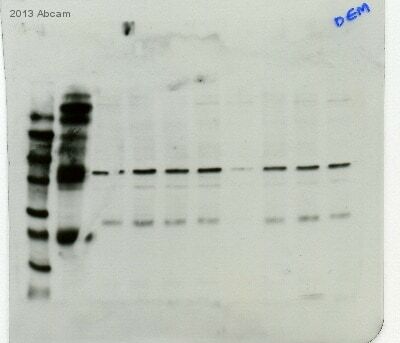 We have used this antibody in WB and detecting many bands. We are using a human cancer cell line and detecting multiple bands. We have tested the recommended dilution of 4ug/ml as well as lower concentrations. We have tried milk and BSA as a block with no change in the results. We would like a new lot. Thank you for contacting Abcam regarding ab13248.